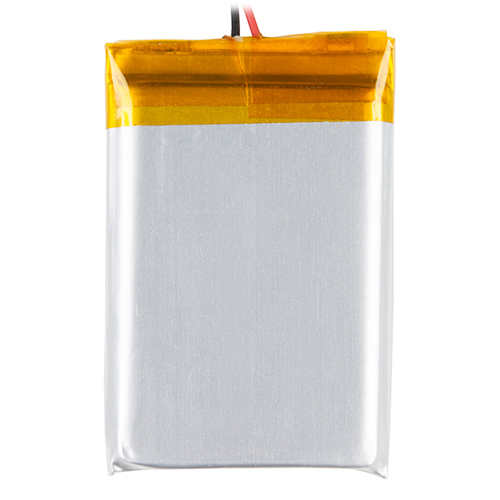 These are very slim, extremely light weight batteries based on Lithium Ion chemistry. 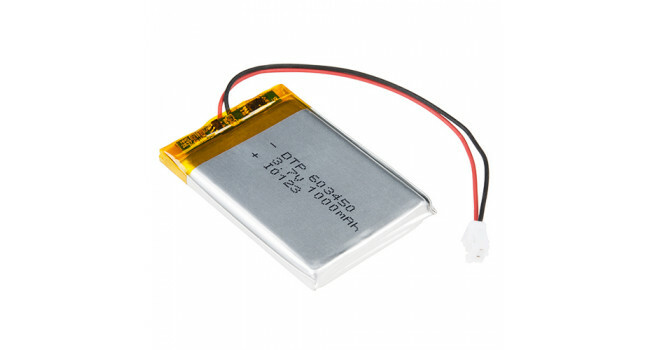 Each cell outputs a nominal 3.7V at 1000mAh. Comes terminated with a standard 2-pin JST-PH connector - 2mm spacing between pins. These batteries require special charging. Do not attempt to charge these with anything but a specialized Lithium Polymer charger. 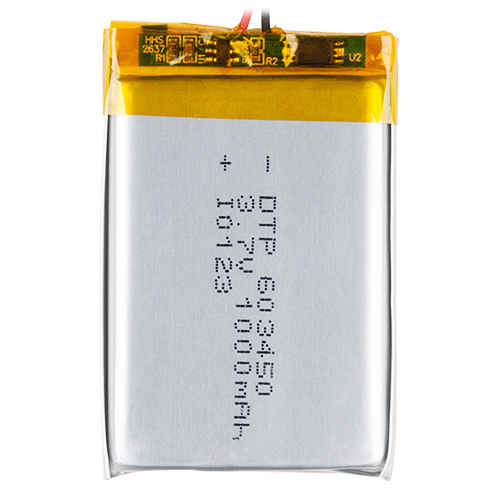 Battery includes built-in protection against over voltage, over current, and minimum voltage. Please use caution when using this battery in wearable projects. When using conductive thread, a short in the thread can create sparks and heat. USB Lion/Lipoly charger This is a Lithium Ion and Lithium Polymer battery charger based on the MCP73833. It uses a USB mini-B for connection to any computer or 'USB wall adapter'. Charging is perfo..
JST-PH Battery EXT Cable - 500mm (Pitch 2mm) This handy extension for all of our JST-terminated battery packs such as our LiIon/LiPoly and 3xAAA holders. One end has a JST-PH socket, and the other ..
JST-PH 2 Pin Connectors - 90Deg Bend - Pitch 2.0mm (10 Pack) This is a JST-PH connector PCB mount, we sell them in packs of 10. JST-PH pitch (spacing between terminals) is 2.0mm. Great for connecti..
Mini Solar Lipo Charger Board The solar/LiPo Charger is extremely affordable and easy to use. No programming is required. Plug it in and it works. The internal charger IC handles all the power flow b..
Sparkfun LiPo Charger Booster - 5V/1A The SparkFun 5V/1A LiPo Charger/Booster is a no-nonsense circuit for generating 1A from a Lithium Polymer battery at 5V. This LiPo charger is a very economical c..
JST-PH 2 Pin Connector + 20cm Cable (4 Pack) JST-PH connectors are compact small connectors with a 2mm pitch. This kit contain 4 sets of Male Female connectors. We made it easy and connected 200mm pi..
JST-PH 2 Pin Connector - Vertical Mount (10 Pack) This is a JST-PH connector PCB mount, we sell them in packs of 10. JST-PH pitch (spacing between terminals) is 2.0mm. Great for connection to Lipo ba.. Battery LiPo 200 mAh 3.7V A Li-Polymer Battery is the best solution for adding an autonomous and stable power supply to your devices that require mobility and long-lasting energy source.This is a ..
Mini Solar Charge Mod 500mA This is a super mini solar Lipo charger based on a single lithium battery charging management chip CN3065. This Solar charger provides you with the ability to get the hi.. 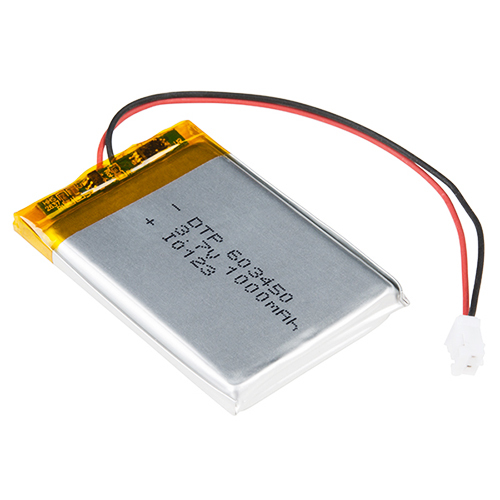 Battery CR-1220 3V 5 Pack Panasonic’s primary lithium batteries are compact, high-energy, highly reliable, and suitable for a variety of applications. The full 3 volts in these high-energy batteri..